The night Brianna Hinojosa-Flores was diagnosed with triple-negative invasive ductal carcinoma, she lay in her bed with her mother and asked, “Do people die from this?” With no family history of the rare form of breast cancer, the wife and mother of two tried to comprehend her chances of living. “Yes, they do,” responded her mother, a nurse practitioner who had been an example of tenacity to Hinojosa-Flores, her only daughter, all her life. “But that is not an option for us.” Hinojosa-Flores knew she had no option but to fight. It has been almost 18 months since Hinojosa-Flores resolved to dedicate herself to surviving. During that time, she has walked in numerous fundraising races, painted her toenails purple (the color of cancer survivors), and faced her diagnosis with the same focus that she brings to her professional endeavors—focus to which her status as senior manager and patent attorney at BlackBerry and a dogged congressional campaign run are a testament. What are the current trends in the mobile industry? People want to be able to communicate anywhere, anytime and want access to data at their fingertips. They don’t want to have to carry multiple devices. They want one device that allows for secure communications at work, yet accessibility to personal content for all of their applications, such as a phablet (a phone and a tablet combined). Being a mobile consumer myself, I understand that trends change rapidly and vary depending on the target audience. How is BlackBerry staying relevant? As more confidential data is taken beyond the walls of organizations and into mobile devices, it is vital to ensure that mobile communications and the devices supported by enterprise platforms are not compromised. BlackBerry will continue to be the number one player for security and productivity. From a mobile enterprise perspective, BlackBerry is synonymous with security. Security is built into everything we do, and we have been doing it longer and better than anyone else in the industry. How has the Hispanic population contributed to change in the mobile industry? We are seeing more and more Latinos pursuing careers in STEM-related fields. As a result, Latinos are in positions to influence the technological advances of the future, especially in telecommunications. Her path to the mobility giant began as early as middle school. 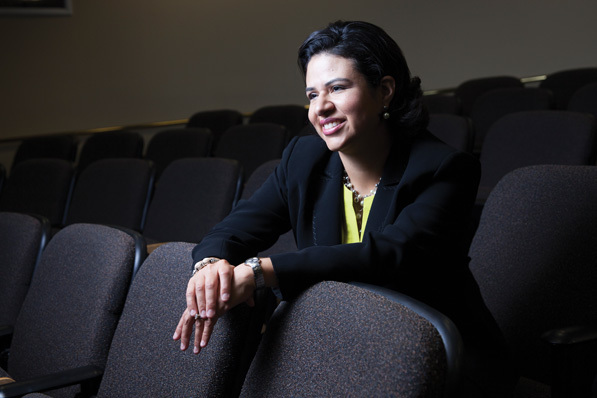 From a young age Hinojosa-Flores tutored classmates in math and science, her favorite subjects. She entered Trinity University in San Antonio with dreams of working for NASA and earned a degree in electrical engineering in pursuit of that track. While she came close, working on military F-14 and F-15 aircraft at Science Applications International Corporation, her engineering background took her in a different direction. She was impressed with the intellectual property (IP) attorneys she worked with, who not only utilized engineering expertise but also legal training to protect innovative ideas. As a result, she earned her juris doctorate from St. Mary’s University School of Law in San Antonio to do the same. After a few years in private practice, Hinojosa-Flores entered the corporate world in 2001 as a patent attorney with Uniden America Corporation. With yet-higher goals of becoming a chief IP counsel one day, she embarked on an MBA at the University of Texas at Arlington, which she completed prior to landing at Research in Motion (now BlackBerry) in 2009. Amid her climb to senior manager and patent attorney, there was another endeavor she wanted to take on: politics. Hinojosa-Flores’s first exposure to the political system was in the National Hispanic Institute’s Lorenzo de Zavala Youth Legislative Session, her sophomore year of high school. Her involvement in the League of United Latin American Citizens (LULAC) also fostered a desire to someday take part in public service. “As an effective leader, you want to challenge the status quo and identify opportunities for improvement,” she says. “I knew while serving as national youth president for LULAC while at Trinity University that I wanted to run for office one day.” After moving to Coppell, TX and settling down, she realized that day had come. Her father, a successful entrepreneur despite only having a high school education, was also an influence on Hinojosa-Flores. He taught her the value of customer satisfaction and the soft skills that permeated into her community work. As a kid, whether she was volunteering at the Texas Department of Human Resources with her aunts or playing her violin at local nursing homes, Hinojosa-Flores practiced the art of communicating, but more important, listening, wherever she could. During her congressional campaign, Hinojosa-Flores had a finger on the pulse of IP-critical business in Texas. With so many large tech companies there (such as BlackBerry) who incurred large costs having their patents examined in Washington, DC, it was important to have local access to government offices. So when the US Patent and Trademark Office was looking for a site for a new satellite office in Texas, she used her knowledge and expertise as a patent attorney to lobby support in favor of bringing the office to Dallas, facilitating some of the area’s biggest business. After her defeat, Hinojosa-Flores threw all of her energy into working for BlackBerry. At the Canadian telecom company everything from the look to the feel and functionality of its products must be patent-protected, which falls under Hinojosa-Flores’s scope. She employs her varied experience in patent licensing and litigation, validity and infringement analysis, trademark, and copyright protection. She also manages patent prosecution operations as well as a team of paralegals and patent attorneys. On the business side, she upholds BlackBerry’s commitment to security as a champion of its data integrity. It was while starting to manage her new team in operations that her doctors informed her she had the rare and aggressive type of breast cancer. To Hinojosa-Flores, slowing down wasn’t an option. When her breast surgeon informed her that treatment would be a year-long process, Hinojosa-Flores began thinking of ways to cut the time down. Her battle with cancer was not something she hid at the office. She instead used her experience as an example. “It was important to me to be a strong role model for my team through this personal challenge,” she says. When she isn’t working 50-60 hours a week, Hinojosa-Flores can be found volunteering in her community or participating in other organizations. She currently chairs the Las Colinas Medical Center board of trustees, sits on the board of advisors for the Trinity University engineering department, and on the board of directors for the Coppell Family YMCA. She also serves as secretary for the LaunchAbility early childhood intervention program board of directors. 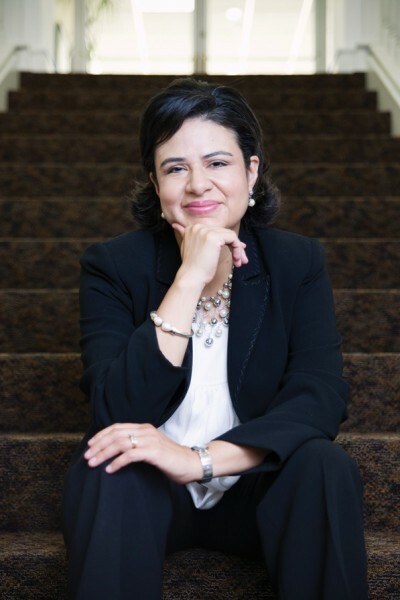 In between her healing process and her board leadership, Hinojosa-Flores continues to be visible and accessible to her team. And even more important than all this, she loves spending quality time with her husband, Juan Carlos Flores, and their two children, nine-year-old Ivan and five-year-old Gabriela. “I have a strong faith that has grown stronger through this breast cancer journey,” she says. “I believe I was chosen to go through this journey and turned this challenge into an opportunity. I wanted my team to see that if I can get through this, they can get through anything, too.” With faith, family, and friends on her side, Hinojosa-Flores is happy to be cancer-free today.